Retail is not economic development; it is the result of it. However, time and time again it is billed as economic development in the St Louis region. Mayors, council members, aldermen and others use it as evidence they’re serving their constituents. Several factors contribute to the misuse of TIF for retail – the lure of new stores, the illusion of growth from abandoning the old big box for the new one, powerful developers, construction labor interests, and how we fund our municipalities in our fragmented region through sales taxes. In St Louis County some cities are in whole or in part point-of–sale cities where some of the 1% sales tax levied goes to the municipality where the sale occurred and the rest goes into the pool. The rest are pool cities where the sales taxes generated are put into a pool and given back to cities and the county (for the unincorporated areas) on a per-capita basis. The pool takes into account the reality that many who shop in a particular town are not residents there (however sales taxes from sales by residents of other counties stay in the county). Dozens of the tiny cities in St Louis County have no or very little retail sales and thus little sales tax revenue to fund operations. This creates a vexing regime where point-of-sale towns grasp for sale tax revenues, and the pool props up tiny often dysfunctional municipalities. The one percent sales tax continues to be the single largest revenue source for the City of Ellisville. This sales tax is generated from all retail sales that take place within St. Louis County. It is distributed to the cities in the County and to the County for unincorporated areas based on two different methods. The first is based upon where the sale was made with some sales tax being redistributed to the second method based on a complex calculation utilizing per capita sales tax receipts. The second method is based on the population of each area that uses this method. In 1978 the City of Ellisville chose the first method because it provided greater revenue to the City. This method still provides more revenue. Areas that have been annexed since that time are required to be a part of the second method. The table on that page reveals that sales tax receipts have fallen 8% over the last decade even before taking into account inflation. So when a developer comes along and offers the redevelopment of empty car dealerships, the removal of yucky multi-unit apartment buildings, a shiny new Wal-Mart, and $600,000 in new sales tax revenues (a 26% increase over 2012 city sales-tax revenues estimate) city fathers jump to attention. All this could be yours for $11 million in tax increment financing and $4 million in other tax subsidies. 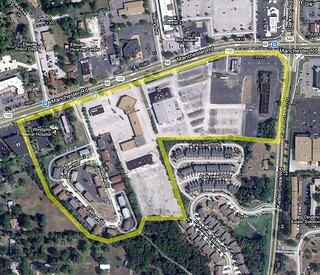 This may give the illusion that Ellisville is economically healthy, while the region continues giving away its wealth. Given the stagnant population and wealth of St Louis County and the site’s distance from other counties, it is apparent that this new development would have no net increase in revenue when viewed from a county-wide lens. The 12-member Ellisville TIF Commission consisting of six members from St. Louis County, three from Ellisville, two from the Rockwood School District and one from public library system, voted it down 7-4 with one member not in attendance voicing opposition to the TIF. Under state law the municipality can override that vote with a super-majority of its own city council. Some citizens of Ellisville mobilized against the development. They either didn’t want to be displaced by the demolition of the apartment complex, didn’t want a Wal-Mart, didn’t want to subsidize a development, and/or they could see it was a no net gain proposition for the region. They spoke out at council meetings, successfully delaying the vote. The TIF was a big issue in the city’s election in April. An anti-TIF candidate, Adam Paul, won the mayor’s race. The council delayed the vote again until the new officials were sworn in. The new mayor promised the TIF over his dead body. Then Best Buy announced the closure of its Ellisville store. This loss likely tipped the scales, and the TIF passed by the 5-2 vote necessitated by the County TIF Commission’s rejection. Now some citizens are working to recall some of the city council members. Paul, the mayor, who campaigned as an opponent of the TIF, asked the council to consider the entire region, not just the city. The new store, he argued, would only take sales tax dollars from other cities. This statement and Pauls position on the issue puts him leaps and bounds ahead of many elected officials and power-brokers in the region. Even officials who see the negative impact of TIF, especially for retail, appear to still hope that their municipality can come out a “winner” on retail development before anything changes. Regrettably he is only one of 90 and mayor of just 9,193 people, a little less than 1/100 of St. Louis County. A TIF reform bill has unanimously passed the State Senate. Sponsored by Sen. Scott Rupp, R-Wentzville, the bill would require a two-thirds majority vote of the citizens of a city to overturn a rejection by the County TIF Commission. This would apply to St Louis, St Charles, and Jefferson Counties. Including the City of St Louis is not relevant because it is also the County of the City of St Louis and therefore a situation like Ellisville cannot occur. The bill is a step in the right direction. Ideally there would be a regional (including the Metro East in Illinois) TIF Commission and TIF would rarely be used for retail. Incentives should be used to grow our own companies or attract others from elsewhere, not taking income from residents of the region and giving it to large retailers. Optimistically this tale shows that citizens and leaders are starting to get it. The region has not and will not prosper by demolishing residential areas and displacing residents for the benefit of retail development. This has been shown to be less than a zero sum process for the region. TIF must be reserved for truly economically depressed areas and the region must begin operating as the single economic region it is. *Originally published May 23, 2012 on nextSTL. St Louis Unite is my effort to foster the conversation about cooperation and consolidation in St Louis. Chiefly the annexation of the City into the County.